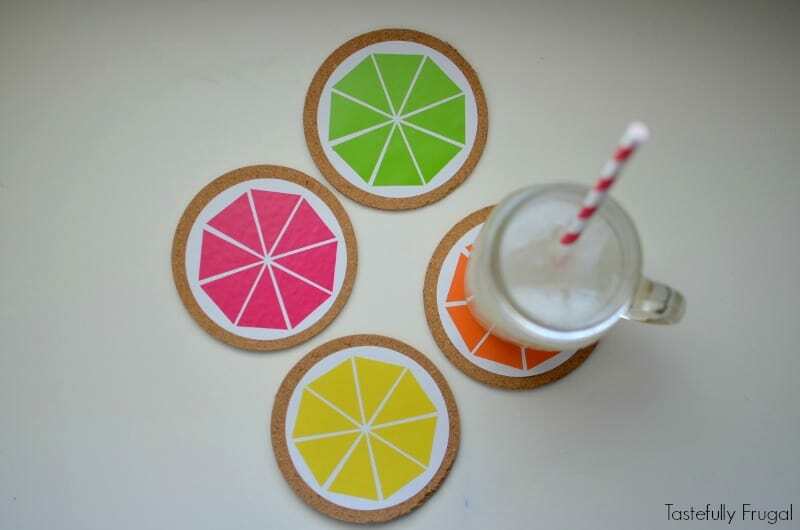 Bright and colorful citrus fruit drink coasters you can make in less than 5 minutes. Happy Monday and Happy First Day of Summer! Even though it feels like it’s been summer for the past 3 weeks I’m excited summer is officially here; and I’m kicking off summer in a big way! Tune in at the bottom of this post for your chance to win a brand new Cricut Explore Air with the Everything Bundle Kit! 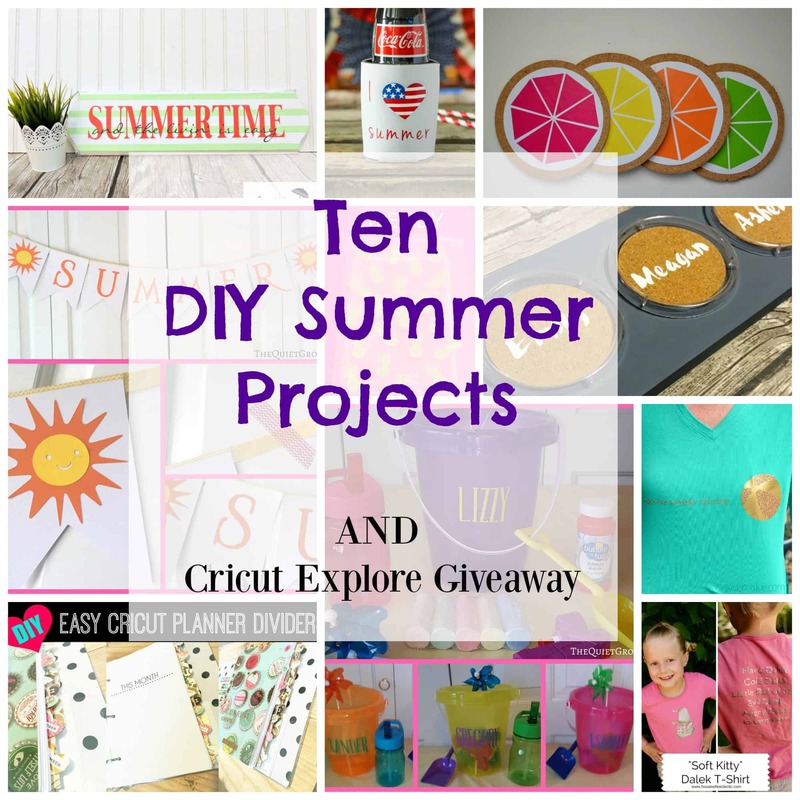 But first I have to tell you about the Cricut Summer Challenge. This is my first official “challenge” with Cricut and the theme was summer. There are so many things you can do with a Cricut Explore it was hard for me to pick just one. So when I thinking about what summer meant to me one of the first things that came to mind was ice cold lemonade. I started brainstorming lemonade ideas that I could make with my Cricut. That same day I dropped a coaster on my foot and broke it (the coaster not my foot). 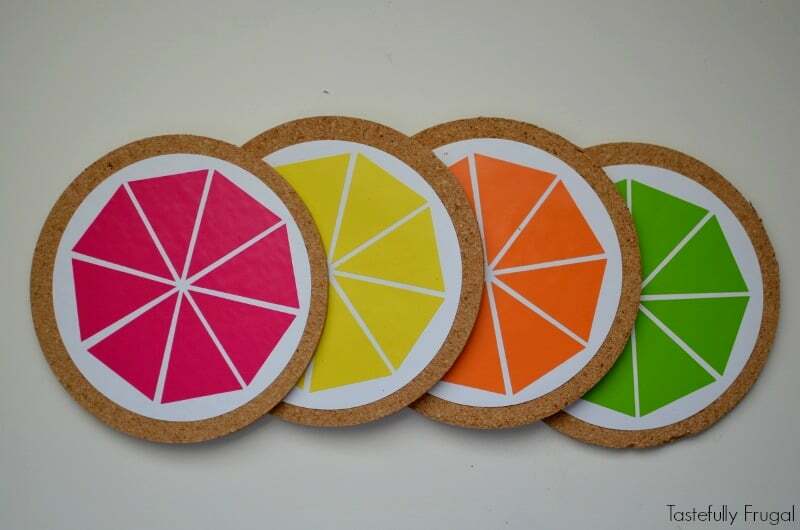 And that’s when the idea came to me; citrus fruit coasters! These are SO easy to make with your Explore Air; you can make a full set in less than 5 minutes. 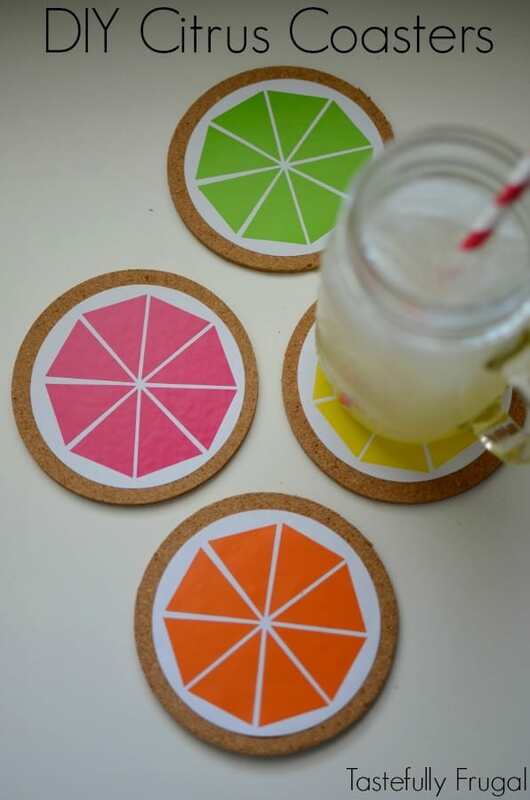 All you need are cork coasters (I bought a 6 pack like these at Hobby Lobby for $2), white, bright pink, bright yellow, orange and lime vinyl. Click here to open design in the Design Space. Change the visability of the eight triangles so that all that cuts at first is the circle (click on the eye next to the triangles in the drop down menu on the right side so that there is a slash through the eye). Cut the circle out of white vinyl. Center circle on coaster and use the scraper tool to make sure it attaches well to the coaster. Go back to the design space and un-hide triangles (click on the eye again) then hide the circle so only the triangles cut this time. Make sure to weld the triangles so that when you cut them they stay in the same position they are in in the design space (click above the first triangle, drag your mouse, create a square around all 8 triangles. Then at the top of the drop down menu click WELD). Cut 4 sets of triangles one each of pink, yellow, orange and green. Line up triangles center inside white circle and use scraper tool to make sure they are smooth and attached well. Now you’ve got bright coasters that will protect your tables and add a pop of color to your decor. These would make a fun neighbor gift too; just buy a bottle of lemonade and attach the coasters with some bakers’ twine. Love this project but don’t have a Cricut? Well today is your lucky day! 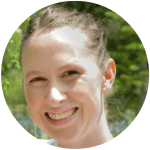 I’ve joined a talented group of bloggers and we are giving away Cricut Explore and Everything Starter Kit Bundle! Enter through the Rafflecopter below and for more chances to win check out these other summer projects! Would love to make a stencil to put/paint on an old treated wood, for an art sign inside the house. Just darling! So bright & fun. Shared on Twitter! Your coasters are adorable! 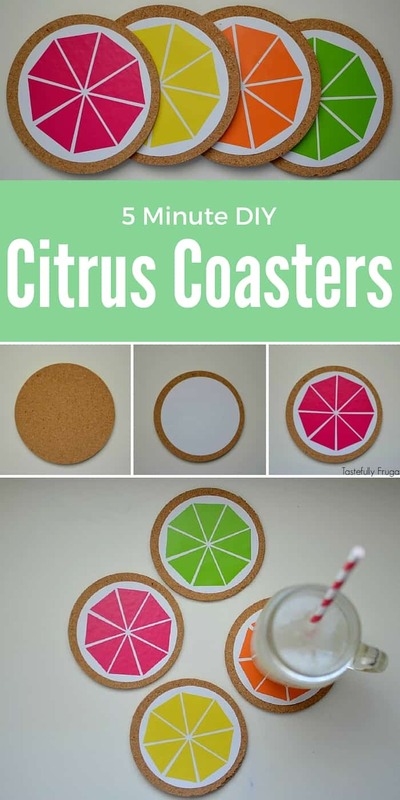 I would love to make some fun summer coasters as well with the cricut! It would be fun to make some for each season/Holiday! I would like to make the Soft Kitty Dalek T-shirt for my granddaughter. I have a whole list of ideas for wood stencils that I would make with the Cricut. I have a friend who has wanted a cricut machine, so this one would go to her. I would love to make decorations for my soon to be 2 year old’s birthday party. These coasters are adorable! I would love to win this bundle, I have so many project ideas! These are so cute– I love everything citrus! What a pretty project. I have know lot of things about your s project. Thanks.